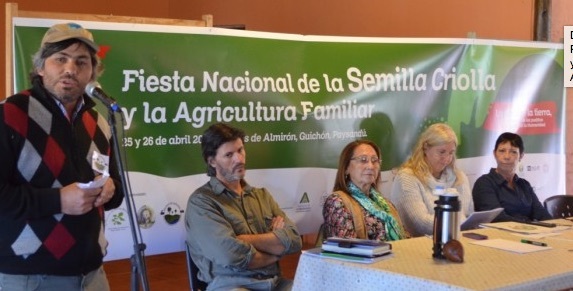 On April 25 and 26, at the Baths of Almiron, near the city of Guichón, was held the 7th National Meeting of Producers of Creole Seeds and the 6th National Festival of the Creole Seed and family farming, under the slogan “Native seeds and the land as the heritage of peoples in the service of humanity”, drawing over 900 people. Once again, native seeds, household production, biodiversity, women, rural schools and agroecology had their festival. The festival is a biennial space of meetings, exchange and coordination, organized by the National Network of Native and Creole Seeds. It integrates about 300 farming families from across the country articulated in 27 local groups. This time, the organization was in charge of the Guichón Collective in Defense of Natural Goods, the Paysandu Organic Garden Group, REDES – Friends of the Earth, the Program for Sustainable Uruguay, the Melchora Cuenca Schools (Paysandu) and Agrarian Guichón, and Tecnicatura of Family Farming. The Seed Network is a joint initiative of local family producers, the Network for Social Ecology (NETS) – Friends of the Earth Uruguay and the Faculty of Agronomy of the University of the Republic through the Southern Regional Center. As part of the festival there was an exhibition of Biodiversity with an exchange of native and creole seeds, accompanied by the presentation of collective experiences of urban and school gardens and the flour milling cooperative GRANECO. There were two roundtables: one on the National Plan of Agro-ecology and the impacts of genetically-modified crops and pesticides in rural populations, territories and watersheds ; and the other a space for analysis and in-depth debate on key issues central to the present and future of our country and our food sovereignty. The workshops discussed the implications of the extraction of fossil fuels by hydraulic fracturing, the concept of privatization-financialization of nature and the production and conservation of seeds. We vindicate the knowledge of those who live on the land, and we are committed to share it with society, especially with young people. We pledge to participate in the construction of a National Plan of Agroecology, to be based on the needs of producers with a strong regional emphasis. This plan must integrate various programs – Creole and Native Seeds; Soil conservation; Water and sustainable management of watersheds; Local procurement markets and priority of ecological production; Access to land, especially for young people; Support for collective entrepreneurship; Training and participatory research in agro-ecological production systems, especially for young people; Research and development that meets the needs of producers and is adapted to local conditions. The program must also recognize the role of women and youth and promote the exchange of experiences and knowledge between the towns and regions, promoting and supporting meetings, workshops and collective regional and national conferences. We also denounce and demand appropriate responses by the State to confront the problem of genetically modified contamination of our seeds. This contamination has already been proven as well as the impossibility of coexistence because of the massive use of pesticides in our territories that threaten our health, water resources and biodiversity, including bees whose disappearance threatens the pollination of our plants and the livelihoods of the beekeepers. We also call attention to the danger posed by the possible approval of new transgenic traits resistant to 2,4-D and Dicamba which are herbicides even more toxic than glyphosate whose toxicity, about which we have warned long ago, was now confirmed by WHO. Finally, the Network for Native and Creole Seeds, as a nationwide organization based on the land, promises to be vigilant and denounce all attacks on the health of the population and the environment (water, soil, biodiversity) caused the predominant agricultural development model and we will require the State to fulfill its role as guarantor of the rights of the population.